First, I am curious that the common off-the-shelf LEDs have a capability of blinking with such a high frequency. Datasheet of LEDs that currently I'm using is here. I have no idea which information I should see for my purpose. Or you could suggest me other products. Second, is there a sensor (photoresistor, etc...) that have such a good time resolution for sensing rapidly blinking LEDs. My candidates are two, CdS cell photoresistor and Light sensitive Voltage generator. Again, which information I have to look into? p.s. I'm asking these questions since I want to build a visible light communication systems. I have succeeded in making LEDs blink 32 times per second. But beyond that, I cannot figure out whether it works or not with bare eyes. Pretty much any LED available can be operated at far higher blink frequencies than 1 KHz: White LEDs or others which use a secondary phosphor would be the slowest, often topping off in the 1 to 5 MHz region, while standard off-the-shelf primary LEDs (red, blue, green, IR, UV etc) are typically rated at a cut-off frequency of 10 to 50 MHz (sine wave). The cut-off frequency is the maximum frequency at which light emission drops to half the initial intensity. Few LED datasheets list the cut-off frequency, but the rise time and fall time of the LED are more common - unfortunately not for the specific datasheet linked in the question. In practice, one would be safe in topping off at one tenth the cut-off frequency for a well shaped square pulse, so 1 MHz visible light communication is very reasonable. As long as LEDs are SMD or with very short lead lengths, and PCB track / component lead capacitance and inductance are kept to a minimum, driving an LED to 1 MHz is feasible without complex pulse-shaping drive circuits. More academic info on the subject of LED cut-off frequencies can be found here. is there a sensor (photoresistor, etc...) that have such a good time resolution for sensing rapidly blinking LEDs. A CdS photocell would not be suitable for high frequency light sensing: The rise + fall time for common CdS cells are of the order of tens to hundreds of milliseconds. For instance, this randomly picked datasheet mentions 60 mS rise time and 25 mS fall time. Thus the highest frequency it can handle is below 11 Hertz. Photodiodes and phototransistors are preferred options for sensing higher speed light pulses at low to moderate intensity (i.e. at a distance from the LED source). This datasheet for the BPW34 PIN diode indicates rise and fall times of 100 nanoseconds each, which would tolerate 5 MHz signaling, so keeping a margin of safety, 1 MHz would be comfortable. 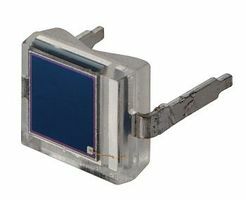 For higher signaling speeds and lower signal intensity, super-expensive high speed Silicon Avalanche Photodiodes such as this one have rise and fall times of as little as 0.5 nanoseconds, allowing a 1 GHz signal, well beyond what standard LEDs will support. If the emitted signal intensity can be high enough, such as by having the LED source and the sensor near each other, or by using suitable lenses, and the desired signal bandwidth is not too ambitious, then a standard LED of suitable color is itself a suitable light sensor. LEDs work well as light detectors, and would be ample for signaling frequencies of hundreds of KHz, perhaps even up to MHz depending on the specific LED chosen for emitter and sensor. An interesting paper by Disney Research talks about this specific application: "An LED-to-LED Visible Light Communication System with Software-Based Synchronization"
Anindo has already given you excellent direct answers, so this is to add two side points. First you seem to want to "see" the communication, or at least visually see the LED blinking. That's not going to happen beyond a few 10s of Hz because of the peristance of vision of your eyes. Your eyes are much slower than LEDs. Second, since you aren't going to see pulses or flashing at 1 KHz anyway, perhaps you can relax your requirement for visible light signalling. LED signalling is usually done with IR LEDs for good reason. IR LEDs generally require less power for the same light level, or can handle higher current pulses. The ambient light level is usually lower in IR. 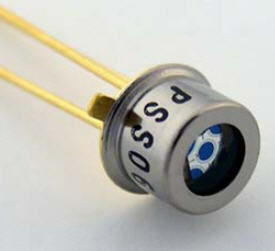 There are also silicon detectors well suited for detecting IR light. 940 nm is a common wavelength. You will find both LEDs and photodiodes optimized for that. Not the answer you're looking for? Browse other questions tagged led light-sensor or ask your own question. Why are there no high intensity tri-color LEDs that have red, yellow, and green?